This capital once formed part of the interior of a church. It comes from the choir area of Mozac Abbey. The abbey was one of many which owed allegiance to the influential abbey of Cluny. The angels each hold a scroll with the opening lines from one of the four Gospels. 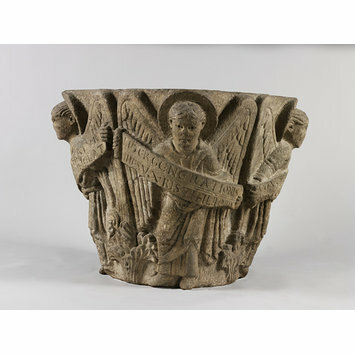 Limestone capital with angels holding scrolls with sentences from the Gospels. The sides of the capital are decorated with angles holding scrolls with sentences from the Gospels. There are four angels, each winged and with haloes, which form the corners of the capital. Their feathered wings spread back to the centre, carved with the shape of the capital. The angles hold diagonally across their bodies a scroll with Gospel inscriptions in Latin (see P. Williamson, 'Catalogue of Romanesque Sculpture', V&A Publication, London, 1983, pp. 16-17 for text of inscritptions). The robes they wear are long and unadorned, falling in simple folds. Their hair is cut neat and short, while their expression is one of quiet determination, with eyes gazing steadily ahead. At their feet are stylized leaf plants, which along with the pentreating gaze of the angels' eyes, and their unnaturally large heads, gives the scene a surreal quality. The exaggerated size of the angels' heads is also a device to enhance the impression that they are leaning forwards, thrusting forwards purposefully and relentlessly with their Gospel message. This capital was originally one of the eight, of which only a few now survive, in the choir of the abbey church at Mozac. The others remain in the church, at the east end of the building. In 1095 - at which time the abbey was still largely a Carolingian building - the hitherto independent abbey at Mozac (also called Mozat) fell into the orbit of Cluny. During the following century the church was completely rebult, probably at the request of Abbot Eustache de Montboissier (1131-47). The choir, the original home of this capital, would have been the first part of the abbey to be built. Earthquakes in the mid-15th century badly weakened the church, and much of it was again rebuilt, causing this capital and the others from the choir to, presumably, be left lying around the neighbourhood. Former owners of this capital lived next to the abbey and it apparently lay about in their garden until it wqas removed to Rome, where Durlacher and Storar bought it. It was then loaned to the Philadelphia Museum of Art, before the V&A bought the capital from Durlacher in 1937. 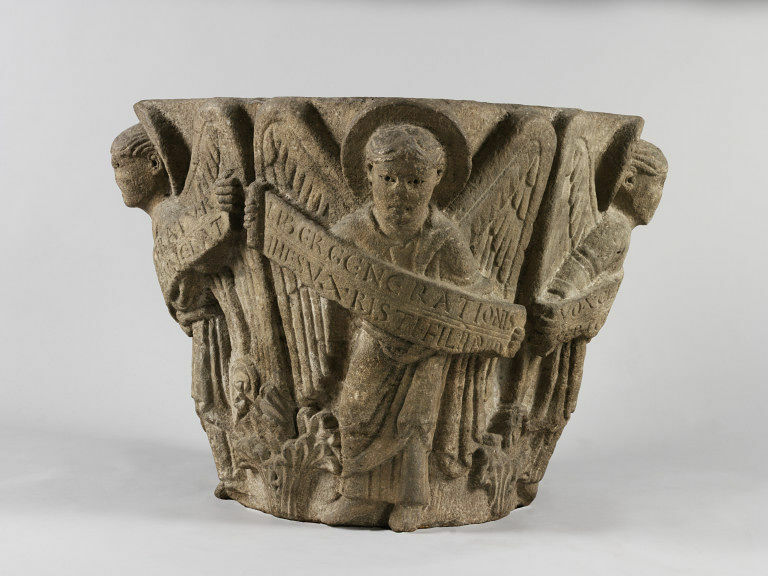 The iconography of the four angels holding scrolls with text relating to the four Evangelists 'appears to be peculiar to the Auvergne region and is also seen on a capital at Volvic, just south of Mozac: here the scrolls simply contain the names of the Evangelists' (P. Williamson, 'Catalogue of Romanesque Sculpture', V&A Publication, London, 1983, p. 16). P. Williamson, 'Catalogue of Romanesque Sculpture' (V&A Publication, London, 1983), pp. 16-17. Trusted, Marjorie. (ed.) The Making of Sculpture. The Materials and Techniques of European Sculpture. London, 2007, p.101, pl.175. Wirth, J. La datation de la Sculpture Médiévalle. Geneva. 2004, pp.246-56, fig. 84.